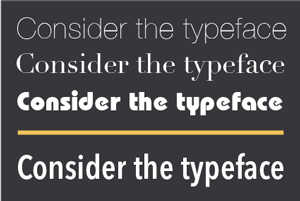 Choosing a typeface: The appearance of type can become altered when reversed; therefore, select a typeface that will perform well under your chosen conditions. A sans serif or a serif design with sturdy serifs is well-suited to reversing. Avoid ultra thin type styles, very light serifs, extreme weight contrast, and small counters, all of which might be compromised when reversed. 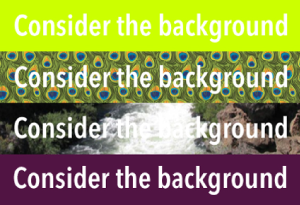 Selecting the background: While reversing type out of a solid, dark background results in a consistent appearance, an irregular or vibrant background can make the type harder to read. This is especially problematic when type is reversed out of a busy image or pattern, bright colors, or variable values. Type reversed out of a more uniform pattern and color range will have the best results. Tweaking the spacing: Light or white type on a dark background tends to look tighter than dark type on a light background. 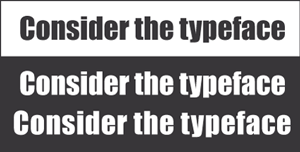 The degree to which this happens depends on several variables, including the typestyle, type size, length of copy, surface (if print), and medium. When this occurs, open up the tracking as necessary to maintain good spacing that does not appear too tight, maximizing readability. Designing for the medium: The appearance of type is affected by its intended medium. For instance, the weight of printed type can change due to ink spread and dot gain, as well as the porosity of the surface it is printed on. Additionally, when type is rasterized for the Web or other digital media, resolution and color will vary, affecting the appearance of the type. Bear all these factors in mind when reversing display type. Make sure the background of any reverse type does not diminish the overall readability.